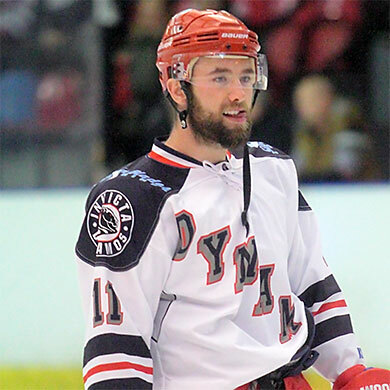 Ahead of his move to the Dynamos this summer defenceman Billy Phillips was synonymous with hockey in Romford where he originally progressed through the junior ranks before his senior debut in 2008/09. Despite his youth, Phillips was icing in the EPL with the Raiders aged just 16 and his displays were enough to attract the interest of nearby Slough who secured his services for the following campaign. 2009/10 would be a defining year for the blue liner who appeared 57 times for a Jets team that scooped the playoff title whilst he also iced for Great Britain at the under 18s World Championships. Another term with Slough looked set to follow but, midway through 2010/11, Phillips elected on a return to his home town club of Romford who were now in the NIHL South. His arrival at Rom Valley Way was explosive but the following year he demonstrated his value to the Raiders with 13 goals and 20 assists from deep in 31 appearances – a return that helped the club take top honours in league competition. Remarkably he also reached the same tally of 33 points in 2012/13 before, last term, adding another 14 goals to his hockey CV whilst playing a role in 13 more. Now though any further points will benefit the Dynamos after the attack minded defenceman agreed on a switch to Kent for the 2014/15 campaign. “We all know Billy’s background and any flair ups that have come up over the years but anyone that has watched him also knows that he is one hell of a hockey player. Without doubt he is one of the top defenceman in this league with a bullet of a shot from the point and a hit that will leave others with more than just their skates on the ice. We’ve played against Billy numerous times in this league and I can honestly say he’s a skater you’d sooner line-up alongside than against so I’m very pleased he will be wearing Mos’ colours come September. Billy’s move to Gillingham is the chance to reset, ditch any baggage and I’m hoping we can keep him in Invicta colours for his foreseeable hockey future. He has plenty of talent, the potential to make a major impact at the Dynamos and bags of aggression. I’m sure all the supporters will join me in welcoming him to the Mos and I’m sure very soon he’ll prove to be a fans’ favourite when he takes to the ice”.